Asset returns encapsulate fundamental features about an economy’s dynamics, such as attitudes toward risk and preferences over future consumption, demographic shifts in the share of borrowers versus savers, and the ebb and flow of inequality in societies. Understanding such features is critical in designing economic policy. In a new paper (Jordà et al. 2017) we collect historical data on the returns of the major asset classes in advanced economies, including for the first time, the returns on residential real estate – the largest component of household wealth of which little has been known until now. We review a few of the perplexing insights that we uncovered. First, a quick review of our new data. In our paper, we construct three types of returns: investment income (i.e. yield), capital gains (i.e. price changes), and total returns (i.e. the sum of the two). We do these calculations for four major asset classes, two of them risky – equities and housing – and two of them relatively safe – government bonds and short-term bills. Importantly, our data consist of actual asset returns taken from market data. In that regard, our data are more detailed than returns inferred from wealth estimates in discrete benchmark years, such as Piketty (2014) and Goldsmith (1985). A key contribution is that for the first time we compile historical returns on the largest but oft ignored component of household wealth – housing. We also follow earlier work in documenting annual equity, bond, and bill returns, but here again we have taken the project further. We re-compute all these measures from original sources, improve the links across some important historical market discontinuities (e.g. closures and other gaps associated with wars and political instability), and in a number of cases we access new and previously unused raw data sources. With these data, here are some of the puzzling results we uncovered. Perhaps the most surprising finding is that total returns on residential real estate are on a par with the returns to equities – on average, about 7% per annum – but they are far less volatile. 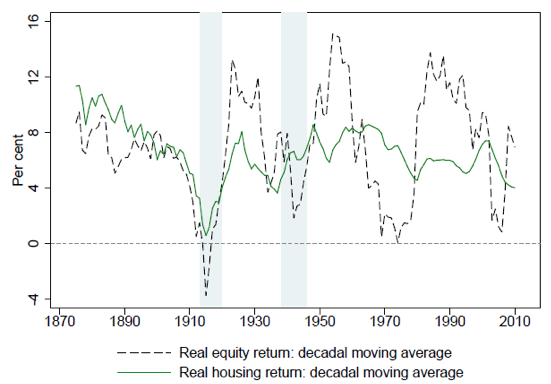 Figure 1 shows decadal moving averages for real returns on equity and housing. In some countries and some periods, equities have performed slightly better than housing, but only at the cost of much higher volatility and higher synchronicity with the business cycle. This is puzzling. Housing portfolios are more difficult to diversify than equity portfolios and transaction costs are admittedly higher. But even accounting for local level variability in house prices, a great deal of this housing puzzle is difficult to fully explain. The mystery deepens when you consider international diversification. Whereas equity returns have become increasingly correlated across countries over time, housing returns have remained globally uncorrelated. International diversification is even harder to achieve, but the thought experiment suggests that the representative investor would do well to hold an internationally diversified portfolio of real estate holdings. Note: real GDP weighted mean returns across 16 countries using decadal moving averages. Our second important finding is that the real returns on safe assets have been very volatile over the long run, surprisingly, more so than risky returns as Figure 2 demonstrates. Each of the World Wars was a moment of very low real safe rates, well below zero; so were the 1970s inflation and growth crises. The peaks in the real safe rate occurred during gold standard times, in the interwar period, and in the mid-1980s fight against inflation. International evidence in Holston et al. (2016) suggests that the natural interest rate has declined internationally since the mid-1980s. Our richer cross-country sample registers a similarly sharp fall in real safe rates over the same time period. But from a long-run perspective, the puzzle may well be why the safe rate was so high in the mid-1980s, rather than why it has declined so much since then. 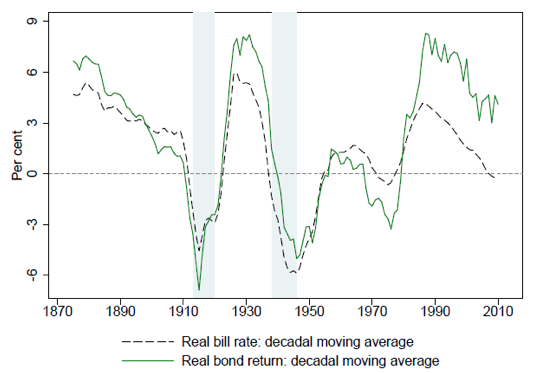 Real safe returns have been low on average, in the 1%–3% range for peacetime periods. Although this combination of low returns and high volatility has offered a poor risk-return trade-off to investors, it has been a boon to government finances. The more an asset pays off when the economy does poorly, the more it insures the investor against economic malaise, and the more the investor will be willing to pay for that insurance – thus depressing its returns and hence commanding what is usually referred to as a risk premium. A vast literature in finance has typically focused on the co-movement between asset pay-offs and economic fluctuations to gauge whether assets are hence properly priced (Mehra and Prescott 1985). However, we find substantial swings in the risk premium at lower frequencies that sometimes endured for decades, far beyond the range of business-cycle swings. In peacetime, the risk premium has been stable at about 4%–5%. Figure 3 shows that there is no visible long-run trend, and, with a few well-understood exceptions, mean reversion appears strong. Curiously, the bursts of the risk premium in the wartime and interwar years were mostly a phenomenon of collapsing safe rates rather than dramatic increases in risky returns. In fact, the risky rate has often been smoother and more stable than safe rates, averaging about 6%–8% across all eras. Recently, with safe rates falling, the risk premium has widened as the decline in risky returns has been smaller, but the gap between the two rates of return is still close to their historical range. Notes: real GDP weighted mean returns across 16 countries using decadal moving averages. Within each country, the real risky return is a weighted average of equities and housing. The safe return is an average of bonds and bills. The within-country weights correspond to the shares of the respective asset in the country’s wealth portfolio. The risk premium = risky return — safe return. One of the most intensely debated economic questions in recent years is the relationship between real returns on wealth, and the real rate of growth. In his influential book, Piketty (2014) argued that if the return to capital exceeded the rate of economic growth, rentiers would accumulate wealth at a faster rate than incomes grow. Comparing returns to growth, or “r minus g'' in Piketty's vernacular, we uncover that in fact “r >> g” for more countries, more years, and more dramatically than Piketty himself reported. Figure 4 shows that the only exceptions to “r>>g” happen in very special periods: the years in or right around wartime. In the pre-WW2 period, r minus g was on average 5% per annum (excluding WW1). As of today, this gap is still quite large – in the range of 3%–4% – and it narrowed to 2% during the 1970s oil crises, before widening in the years leading up to the Global Crisis. Notes: real GDP weighted mean returns across 16 countries using decadal moving averages. Within each country, the real return on wealth is a weighted average of bonds, bills, equity and housing. The within-country weights correspond to the shares of the respective assets in each country’s wealth portfolio. Yet an important puzzle that emerges from our analysis is that the “r minus g” gap does not fluctuate systematically with the growth rate of the economy. This feature of the data poses a conundrum for the battling views of factor income, distribution, and substitution in the ongoing debate (Rognlie 2015). The returns to risky assets, and risk premiums, have been high and stable over the past 150 years, and substantial diversification opportunities exist between risky asset classes, and across countries. Arguably the most surprising result of our study is that long run returns on housing and equity look remarkably similar. Yet while returns are comparable, residential real estate is less volatile on a national level and less globally interrelated, opening up new and interesting risk premium puzzles. Our research also speaks directly to the relationship between r, the rate of return on wealth, and g, the growth rate of the economy. The gap between r minus g figures prominently in the current debate on inequality sparked by Piketty (2014). A robust finding in this paper is that r is much higher than g. On a global level and across most countries the weighted rate of return on capital was twice as high as the growth rate in the past 150 years. These and other puzzles set out a rich agenda for future research. Many issues remain to be explored, in particular the fundamental determinants that drive the returns on each of the asset class in typical economies. For now, we hope our introduction of this new universe of asset return data can provide a basis for new explorations of fundamental economic questions in years to come. Goldsmith, R W (1985), Comparative National Balance Sheets: A Study of Twenty Countries, 1688–1978. Chicago: University of Chicago Press. Marx, K (1872), Das Kapital, London: Lawrence and Wishart. Mill, J S (1848), Principles of Political Economy, with Some of their Applications to Social Philosophy, London: Parker. Rognlie, M (2015), “Deciphering the Fall and Rise in the Net Capital Share”, Brookings Papers on Economic Activity 46(1): 1–69.